I was wondering why are there both Chaos and Order characters to chose from? I thought you could be/do only one or the other during one playthrough? Also I hope you are joking about fanservice thing. Yes but the choice is not immediate, you can initially play as "neutral". We're also thinking about a sort of "secret mode" that would mean the character remains neutral (but in that case you can't romance anyone, so I am not sure will be very popular ). got rid of that mini-grid/map, and started designing a more pokemon style game. Of course, not exactly like pokemon, but 1 vs 1 battle with tag teams. Obviously it's really NOT simple, since all the art was designed to work for a card game... and changing completely the genre... it's not simple. If PSCD sales weren't so bad I'd be tempted to just make this another card game and stop worrying. Gameplay done in 1 month! Forgot about the randomness issue. You could modify it a bit by giving each character a special hero power to use - Hearthstone style - in the event they don't have any good cards in hand. (Wait, that's custom coding again!) Or maybe make a pokemon-card game hybrid. If PSCD sales weren't so bad I'd be tempted to just make this another card game and stop worrying. W/ art like this, I just might not care if it is made as a card game even though I'm not used to playing such! The skeleton alone looks BADASS; reminds me of the movie "Jason and the Argonauts"! Troyen wrote: Forgot about the randomness issue. You could modify it a bit by giving each character a special hero power to use - Hearthstone style - in the event they don't have any good cards in hand. (Wait, that's custom coding again!) Or maybe make a pokemon-card game hybrid. Haha you read my mind. That's exactly what I'll try. Also the "cards" will have more HP, so they will behave like "RPG units". Hard to explain, I'll make some prototypes and tests of course. But this sort of custom coding is fine. I mean, from Loren to SOTW I changed over 5,000 lines of code, not a small difference! And again, I changed a lot of things for QoT. It's doing something from scratch that's bad, also because honestly I wouldn't do it as well as Anima, clean code, etc. Mine is... a hack (but works!). BobTheMob wrote: W/ art like this, I just might not care if it is made as a card game even though I'm not used to playing such! Well it WON'T be a card game - it will only use the same system as PSCD, but modified in a way that you won't be able to recognize it. 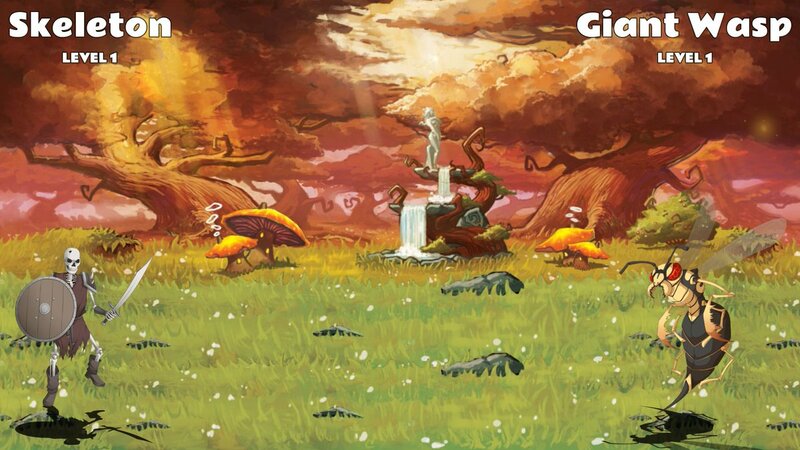 Well, almost The creatures art is great indeed, as are the backgrounds (the Loren's GUI artist did them... 5 years ago! ) and are fully animated. I made some coding using the GUI sketch as base. It's coming out well I think. I will probably ask artist to swap the end turn with the summoning icon (the blue thing on bottom-right). So the small card row at the bottom will be eliminated (also because you won't have "cards" but you can summon creatures on the battlefield). I am thinking that a solution to avoid battles dragging too long could be that you need to "build your army" and each unit costs X mana to add to the army. This way not only you need to have the mana in the battle to summon the creature, avoiding to summon a Bone Dragon (one of the top creatures for Death) at turn 1, but you'll also need to have enough resources when you build up the army. 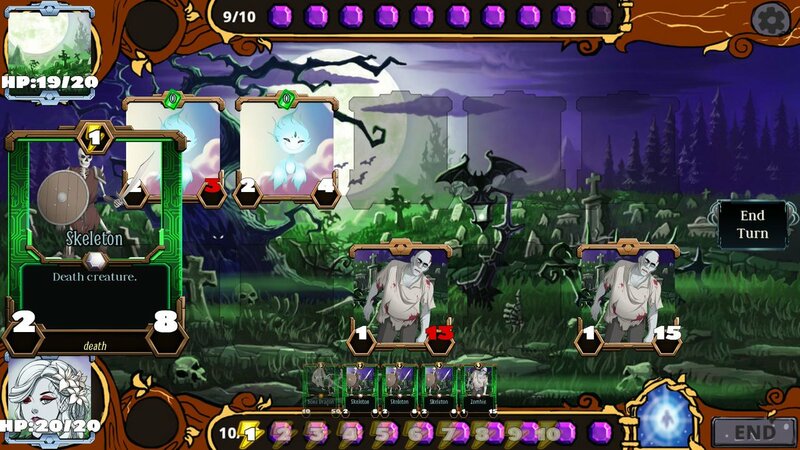 I'll still have limits depending on the creature rarity: you can have 3 skeleton/zombies, but max 1 bone dragon each "army" (Bone Dragon has 10 attack and 50 HP... ). I'm not sure yet how/if I'll allow the big image on the left (the card zoomed in to read the description) or if I just will let player "examine" the card by right clicking on them. I will say the right-click to read the card was kinda annoying on PSCD (being on a laptop), where mouseover explanation would be nicer. But then again, that doesn't lend itself well to touch interfaces. Also, what's the difference between "End Turn" and "End"?